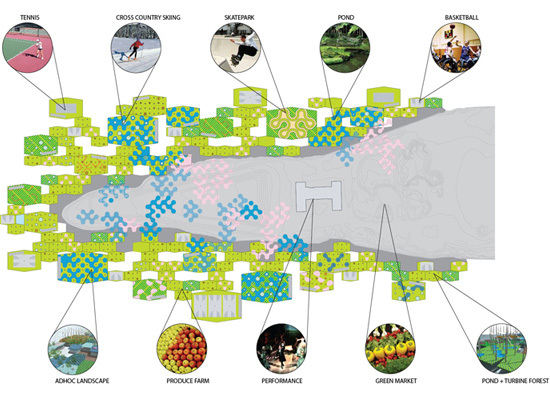 When we were fantasizing about Venice as a reconfigurable jigsaw puzzle, we had in mind, among other things, PARA's submission for an ideas competition to “rejuvenate” the “ruins” of New York City's Roosevelt Island. The barges form a migrating network that extends throughout the regional waters of New York’s five boroughs and beyond. Linking together in multiple combinations, the barges accommodate different events at the scale of the entire Southpoint site. 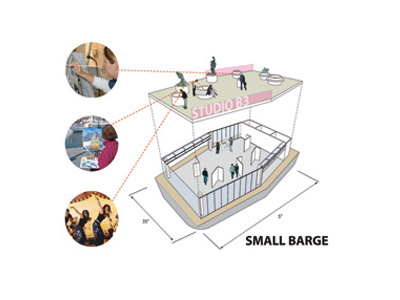 Dispersed throughout the city, the barges bridge culturally disparate enclaves with the vibrant communities of artists already thriving in the city. 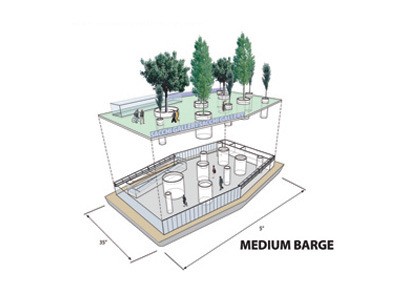 Each barge, then, could hold a tennis court, a skatepark, a farm and a farmer's market, a forest or a combination thereof. There are wind turbines as well. Having been reminded recently of MVRDV's Dutch Pavilion languishing in the now shuttered grounds of Expo 2000 in Hannover and also the ruins of Expo 1992 in Sevilla, we propose that in a future universal exposition, all buildings should rest atop floating platforms. Or are actually the floating platforms themselves. Each one would be built by the participating nations in their own ports, anchored there until the start of the expo nears and the armada needs to be assembled. 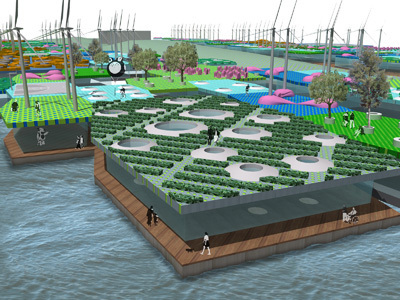 In this world's fair, the overall theme could be future coastlines, perhaps established by Adriaan Geuze of West 8. He is hired as creative director, because he once curated The Flood. 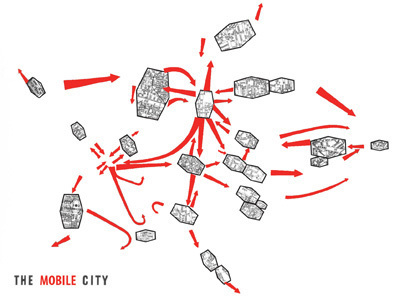 Of course, Adriaan Geuze will have plenty of solutions to combat this threat to showcase at the host city, New Orleans. Or it could be the first ever major international event to be held on international waters, just offshore from Burma's Irrawaddy Delta with a satellite venue a few miles from Bangladesh's Ganges-Brahmaputra Delta. As its national pavilion, the U.S. will send the supercarrier USS Nimitz, which accidentally rams into Zaha Hadid's pavilion. Tant pis. When the expo ends, each pavilion will return to their home port, becoming art centers or public open spaces or artificial reefs. This is the possibly the collest idea I have ever seen for using Southpoint Park on Roosevelt Island !